Department of Pharmacology and Clinical Pharmacy, Faculty of Pharmacy, Andalas University, INDONESIA. Objective: To study the liver toxicity of Cassytha filiformis L. extract and its reversibility in mice. Methods: A total of 108 male mice were used to investigate the hepatotoxicity of Cassytha filiformis extract (CFE) and the reversibility of its toxicity to the liver. Seventy-two mice were treated with CFE orally for 7 consecutive days. A half of these animals were used to study the sleep time on propofol-induced sleep that comprised the sleep onset time (SOT) and duration of sleep (DOS), while another half was used for the quantitation of serum alanine transaminase (ALT) activity. To investigate the reversibility of the liver toxicity, thirty-six mice were treated with daily CFE for 7 days. Activities of ALT and alkaline phosphatase (ALP) were determined and the liver weight ratio was measured on day 0, 1, 3 and 7 after the termination of the CFE treatment. Data of liver toxicity determination were analyzed by two-way ANOVA followed by Duncan’s multiple range test, while data of the reversibility was analyzed by Pearson’s correlation. The significance level was taken at 95% of confidence interval. Results: CFE shortened the SOT and prolonged the DOS significantly compared with control (p<0.05). The activity of ALT was increased due to the toxicity of CFE. However, the ALT/ALP activities decreased and liver weight ratio increased gradually after the extract treatment was discontinued. The trend of these data was correlated significantly (p<0.05). Conclusion: Cassytha filiformis L. extract is toxic to the liver but the toxicity is reversible depending on doses. 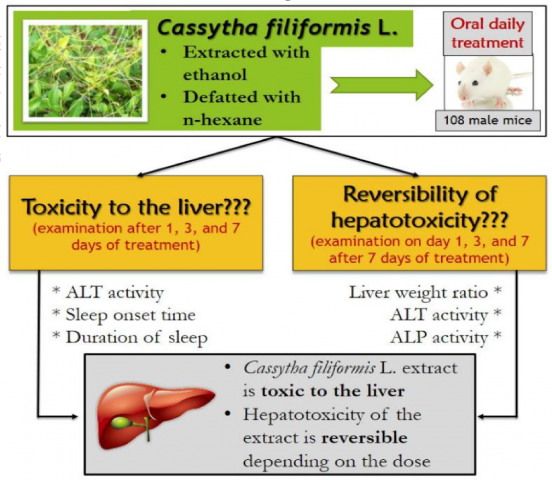 Yuliandra Y, Armenia A, Arief R, Jannah MH, Arifin H. Reversible Hepatotoxicity of Cassytha filiformis Extract: Experimental Study on Liver Function and Propofol-Induced Sleep in Mice. Pharmacognosy Journal. 2019;11(1):69-74.